– Place a tea bag in your cup – add hot water. – Allow to sit for a few minutes – squeeze & remove. – Add a spoon of splenda, a bit of milk, and a dash of vanilla – stir. 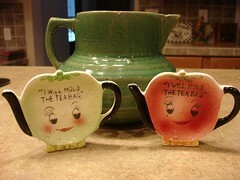 Pictured here is a pair of vintage tea bag holders that I picked up for a dollar at a local shop. I loved the colors! I’ve pictured them in front of a piece of vintage pottery. Oh, Pearl, how cute! What a find. Enjoy your tea. Merry Christmas to you and your family. My mom has a set of those tea bag holders in a cute little wire basket. They are adorable! !